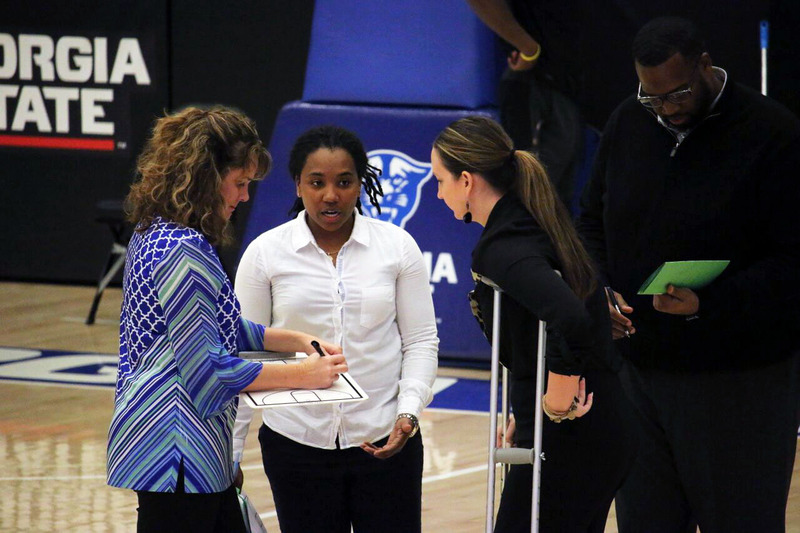 Over the summer, the Georgia State women’s basketball team added two new coaches to the staff, Tron Griffin and Jasmine Young. Griffin is a former college football player turned basketball coach. Young played for head coach Sharon Baldwin-Tener at East Carolina, and afterward, she went on to play professionally overseas. The Signal: So, you played football in college. How did you go from being a football player to being a basketball coach? Griffin: Basketball was always my first love. I kind of played football just to get tough since I was a big guy, and then, of course, the love for basketball took over and being able to help young ladies on the court through the game of basketball took over and has become my passion because I have a 7 and 8-year-old daughter. I enjoy coming out here with the ladies and being that role model and that figure for them. The Signal: How do you think your experiences at some of the other schools that you’ve been at will help you here, at a much bigger school? Griffin: The biggest thing at any level is that when you win and you have some success, you tend to walk away with some skills that can help you at any level go. Winning championships whether it’s at Division I, Division II, or National Association of Intercollegiate Athletics winning championships are come hard to come by. The Signal: What do you enjoy more: being a football player or a basketball coach? Griffin: I did enjoy playing college football. I had an opportunity to win a championship playing college football, but definitely, my most joy has been being a basketball coach. The Signal: You played for Coach Sharon Baldwin-Tener before. How do you think your experiences as a player will help you as a coach? Young: I think that it’ll help me tremendously because I already know her system and a lot of the sets that she wants to run and what she’s expecting—especially from the guard position. I’m already one step ahead knowing what she’s expecting from her player. The Signal: How was your experience overseas, and what was it like living in a foreign country away from home? Young: It definitely took some adjustments, but everywhere that I went, it was just adapting to the culture. That was the main thing, but when you have Skype and FaceTime, it doesn’t seem like you are that far away from home. There are Americans on your team that you get along with and kind of help you with having a sense of being home. I was just there to play ball. The Signal: What was more enjoyable for you: playing college basketball or playing professionally? Young: College basketball. It’s nothing like college basketball. I tell my players and upcoming players to enjoy your college experience. When you get out, playing professionally, it’s work just like anything else. So, I’m was grateful for the opportunity to play professionally and do something that I love, but it’s nothing like the college experience.